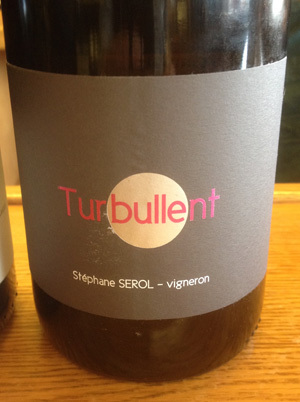 nv Stephane Serol, Turbullent, Natural Sparkling Gamay Rose, Cote Roannaise, Loire Valley, France. This pretty and fun Turbullent “Pet Nat” style méthode ancestrale sparkling Rosé of Gamay by Domaine Serol in the Cote Roannaise is a great summer wine with class, live and plenty of allure. This all natural and organic wine is made from 100% Gamay, hand picked and sorted, fermented in cement vats, temp controlled to keep cold until 7% then finishes fermenting in bottle to 8.5% then disgorged to remove extra material making for an elegant and refreshing bubbly Rosé with vitality and depth of flavor, it has a fruity essence, but feels wonderfully crisp and dry with a soft and vibrant mousse. The Serol Turbullent is pale pink in color with a palate of sour cherry, plum flesh, strawberry, peach and citrus fruits along with hints of yeast/brioche, mineral, rose water and an earthy/grapey note, it finishes with lift and zesty character. Finished in Champagne cork and cage, this is a stylish package without pretense, Domaine Serol is a serious winery with a stunning lineup of wines, including this Turbullent, but also a fantastic selection of old vine Gamay Noir, plus still Rosé and even a Viognier! This part of the Loire is sometimes considered the lost Cru of Beaujolais and it has very little in common with the other more well travelled areas of this region, it is more like the very upper Rhone in fact! Be sure to search out the Domaine Serol wines, they are glorious and rare offerings, and enjoy this lovely méthode ancestrale Rosé over the coming year or so, it is delicately forward and great with food, breakfast, lunch and diner as well as being a superb summer wine pre meals.